vCenter Server 6.7 Update 1 provides the Converge Tool a great tool to converge an external PSC into the vCSA in a straighforward and completely automated way. 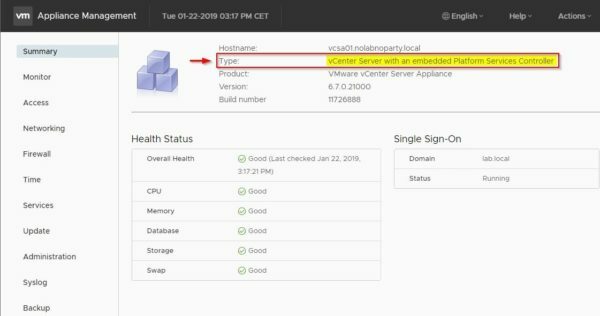 With the release of vSphere 6.7 Update 1, VMware has deprecated the topology model of the vCenter Server with an external PSC in favour of the embedded topology instead. Previously the use of an external PSC was required to support the Enhanced Linked Mode (ELM) but this deployment model is no longer needed with vSphere 6.7. Latest release supports ELM also in an embedded topology. The Converge Tool can be executed in Windows, Linux and Mac OSs. 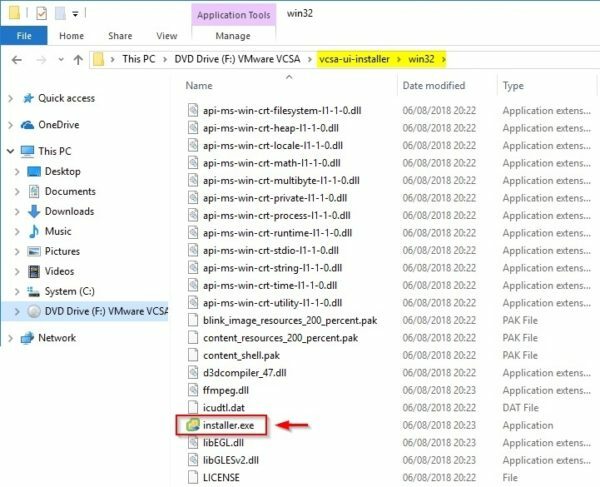 In the vCSA 6.7 Update 1 .ISO file, the vcsa-converge-cli folder includes three sub-folders (lin64, mac and win32) containing the tool for the supported operating systems. 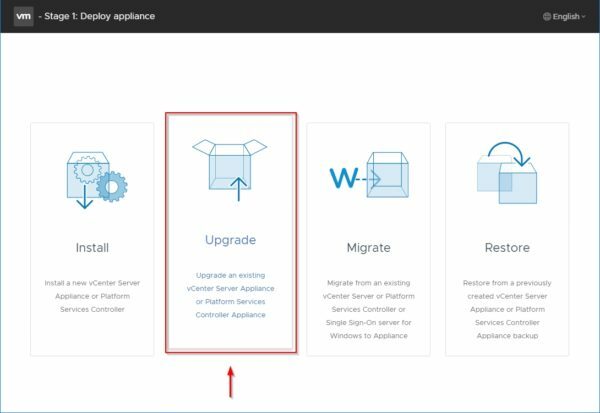 The tool works only with vSphere 6.7 Update 1 therefore make sure your PSC and vCSA appliances have been upgraded accordingly. PSC is always the vSphere component that must be upgraded first. Only the vCSA is supported. Any Windows-based vCenter Server must be migrated to appliance first. Local OS users are not migrated. VHCA must be disabled if configured in your environment. 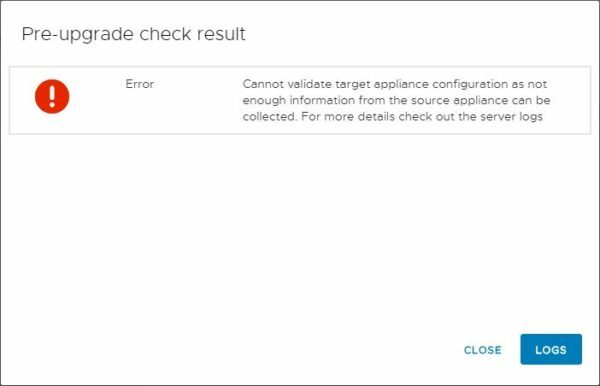 To avoid the appliance is moved during the converge process, the DRS feature should be disabled or configured as manual with the Migration Threshold set to Conservative. Products installed in your environment that use PSC for authentication must be re-registered when the procedure has completed and before decommissioning. 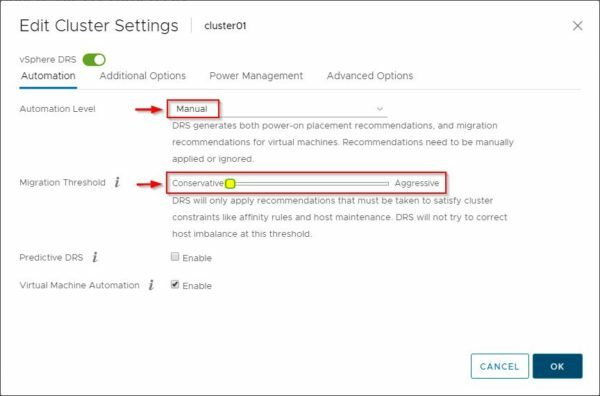 Before proceeding with converging external PSC and vCenter Server, the vSphere DRS feature in the vCenter must be disabled or set to manual to avoid issue with the vCSA during the procedure. 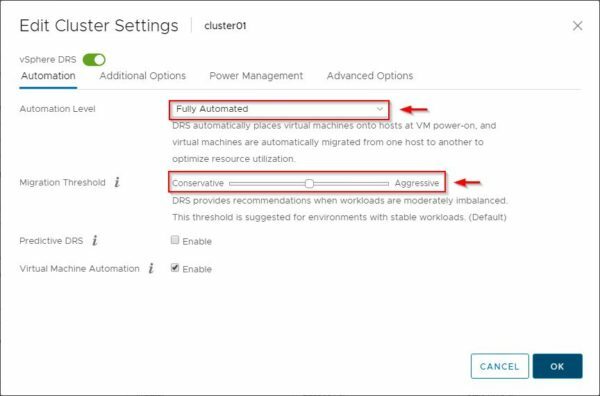 From the vSphere Client, right click the cluster and select Settings. 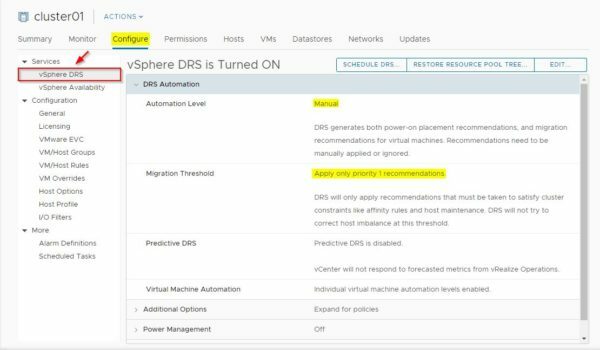 Access the vSphere DRS section under Services and set DRS Automation to Manual with a Migration Threshold set to Conservative. Click OK to confirm. Double check the vSphere DRS has been set to Manual to safely begin the upgrade/converge procedure. 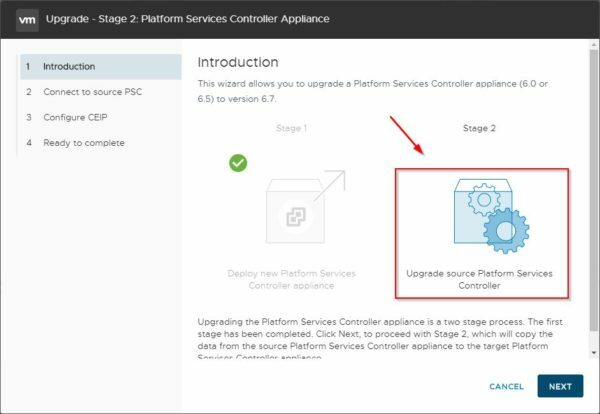 If your PSC and vCSA appliances run a different vSphere version than 6.7 Update 1, both appliances must be upgraded to the correct version before running the Converge Tool. Keep in mind the PSC appliance must be upgraded first to avoid issues. Before proceeding make also sure the upgrade path is actually supported. 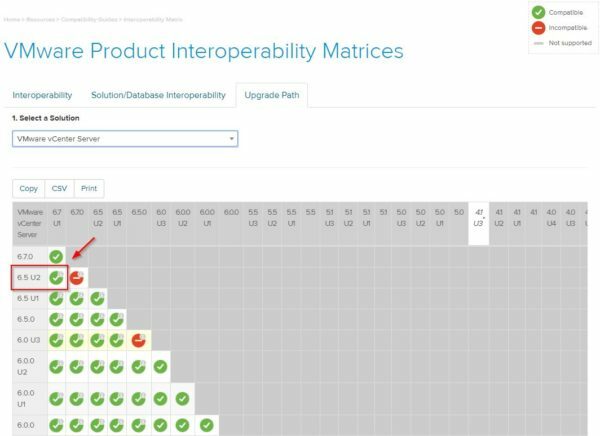 Check out the VMware Product Interoperability matrices to ensure your upgrade path is supported. Mount the ISO file downloaded from VMware website and run the installer from the supported OSs (Windows, Linux, MacOS) by double clicking the installer.exe file. 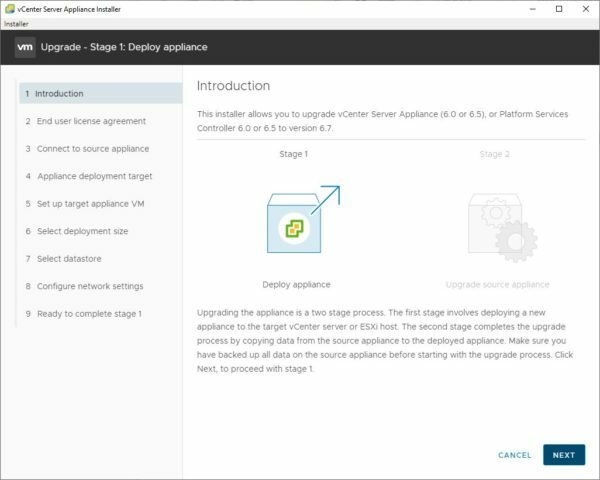 From the Deploy appliance wizard, click Upgrade to begin Stage 1. Click Next to begin the upgrade procedure of the PSC and follow the instructions. The complete upgrade procedure guide can be found this post. The upgrade of the selected PSC is being performed. When Stage 1 of the PSC upgrade process has been completed, click Continue to begin Stage 2. In Stage 2 the PSC upgrade will be executed. If during the upgrade process you face a similar error, make sure the upgrade path is supported. When the PSC has been upgraded successfully click Close to exit the wizard. The PSC has been upgraded to version 6.7 Update 1. Now repeat same procedure for the vCSA. 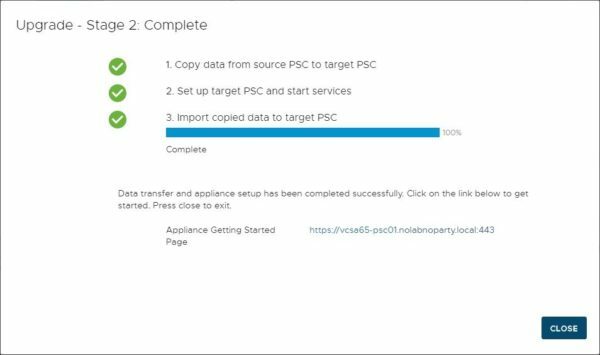 The vCSA upgrade procedure follows same steps as we have seen for the PSC. Mount the ISO file downloaded from VMware website and run the installer.exe file to proceed. 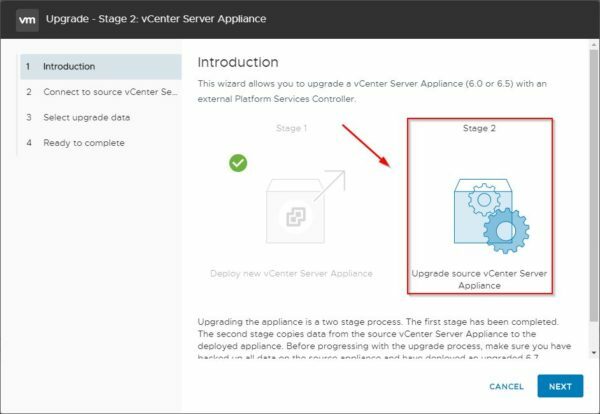 Also for this procedure, select the Upgrade option from the vCenter Server Appliance Installer to begin the upgrade of the vCSA. Check out this article for step-by-step vCSA upgrade. Completed Stage 1, click Continue to begin Stage 2. In Stage 2 the vCenter Server upgrade will be executed. Stage 2 of vCenter upgrade is being performed. When the upgrade has been completed successfully, click Close to exit the wizard. The environment is now ready to proceed with the converge process. Before proceeding with the converge procedure, make sure that vCenter Server and at least one PSC of the vSphere SSO domain have a valid backup in order to restore them in case something goes horribly wrong. 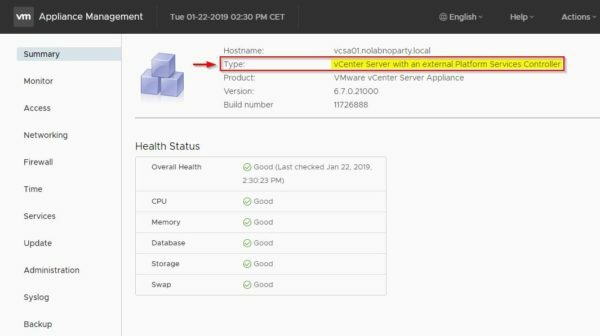 Ensure that both PSC and vCSA are running vSphere 6.7 Update 1. From the mounted vCSA 6.7 Update 1 ISO, access the vcsa-converge-cli folder. Navigate to \vcsa-converge-cli\templates\converge folder and copy the converge.json file to your computer. Edit the converge.json file and fill the required information. Make sure to fill the ad_domain_info section if the PSC is joined to an AD domain. Replication section is not needed if you have just one PSC with no replication partners. If the passwords are not specified, during the converge process they will be prompted. Before proceeding, make sure your computer has network access to both PSC and vCenter Server. Access the vCenter Management Appliance and go to Summary tab. Note the appliance Type is specified as vCenter Server with an external Platform Services Controller. 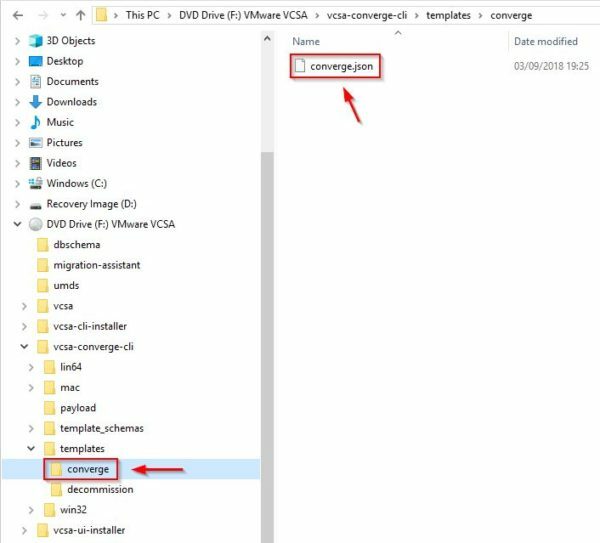 If Windows is the operating system used in your computer, open the Command Prompt and navigate to the folder \vcsa-converge-cli\win32. The converge process is being executed. When the procedure has been completed, type y to reboot the appliance. After rebooting the vCSA, the converge process has been completed. Access once again the vCenter Management Appliance and go to Summary tab. Note the appliance Type is now specified as vCenter Server with an embedded Platform Services Controller. If in your network there are services that use the PSC for authentication, they must be re-registered. Before proceeding with PSC decommission, make sure that all vCSA registered have been converged. 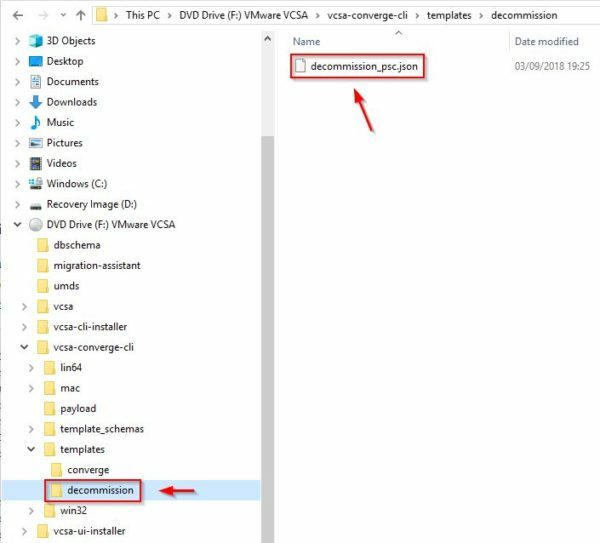 From the mounted vCSA 6.7 Update 1 ISO, navigate to the folder \vcsa-converge-cli\templates\decommission and copy the decommission_psc.json file to your computer. Edit the decommission_psc.json file and fill the required information. port line can be removed if the default 443 port is used. 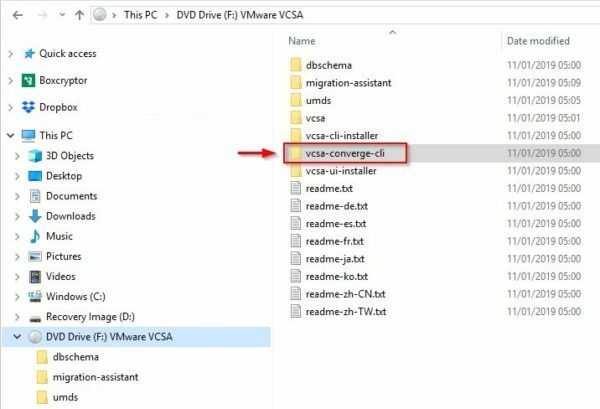 Open the Command Prompt and navigate to \vcsa-converge-cli\win32 folder in the mounted vCSA 6.7 Update 1 ISO. The process is being executed. The tool checks if unconverged vCSAs are still registered to the PSC (the process will fail if any is found) then removes the PSC from the SSO domain. When Successfully decommisioned the PSC node message is displayed, the decommissioning procedure has been completed successfully. The decommissioned PSC is automatically shutdown. You can now restore the DRS configuration for your cluster. A big thanks to Emad Younis with his excellent presentation and precious info provided during VMworld EU 2018 that helped to complete the converging process successfully. Amazing presentation. Absolutely Loved it, I like how you started with the basic prerequisites and went with that flow. I am confident enough now to try this on my own. Thanks alot !